Senator Ted Cruz (R-TX) last month introduced the Equal Treatment of Public Servants Act of 2018 (S-3526), which would ensure that teachers, first responders, law enforcement officers, and other public servants receive Social Security benefits calculated from their work history. Representatives Kevin Brady (R-TX) and Richard Neal (D-MA) introduced companion legislation in the U.S. House of Representatives (HR-6933). These bills follow a line-up of previous legislative proposals in recent years that have attempted to either repeal or reduce the impact of the Windfall Elimination Provision (WEP)– a law enacted by Congress in 1983 designed to eliminate the “windfall” of Social Security benefits received by beneficiaries who also receive a pension based on work not covered by Social Security. 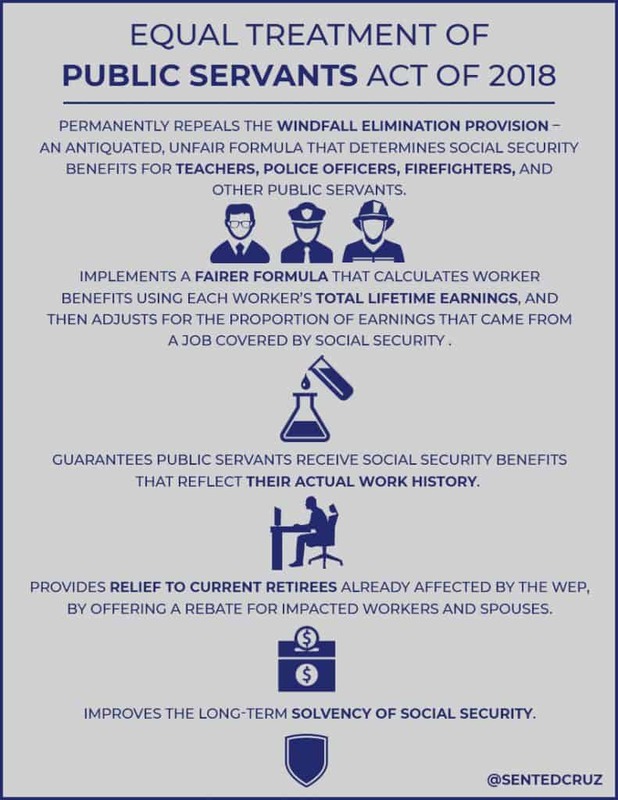 According to an Oct 4 letter from the Social Security Administration to Rep. Brady, HR-6933 would “generally replace the windfall elimination provision (WEP) with a new formula” for individuals becoming eligible for Social Security benefits in 2025 or later. The proposal would also provide for a rebate payment starting in 2020 for individuals affected by the current WEP. To read the full text of the Senate version of the bill, click here. The full text of the House version is here. Many individuals, including federal employees covered by the Civil Service Retirement System (CSRS), Americans employed in foreign countries by foreign employers, and some state public employees do not contribute to Social Security. In spite of their not being able to contribute to the Social Security system in their jobs, many of the aforementioned individuals have at some time during their working careers been able to earn the required minimum 40 “quarters of coverage” or credits to qualify for Social Security retirement payments. Before 1983, these workers were able to receive the maximum benefits from both Social Security and their public pensions.